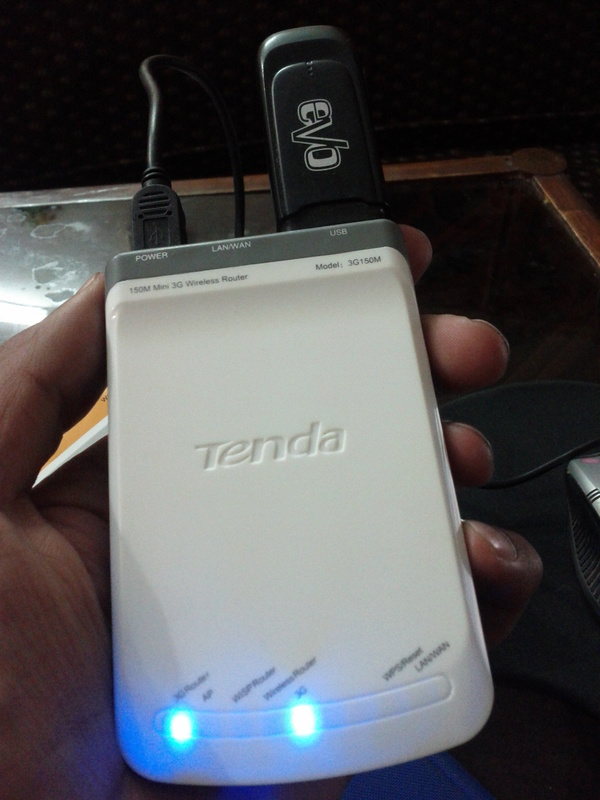 Today, I finally unpacked my Tenda Portable 2G wireless router which I bought in January 2012. Since it supports a USB port for 3G devices, I wanted to see if I can get PTCL-EVO device to connect via this. To my surprise the whole setup was very simple and took just a few minutes. Tenda device cost approx Rs. 3200 in the market and its model is 3G150M (to be precise) and this is how I configured it using the PTCL EVO configuration settings for 3G routers. Step 5? Press next, Click Apply and reboot the router. Then enable Wifi on your Laptop/devices and search for the AP that you configured in step 3 using the same WPA pass phrase configured in step 4. Wifi Device Model no. and Price? plz reply me shop address .u purchase tenda usb. Dear what about this model, 3G186R…? Is 3G150B supports Huwaei EC1260-2. and asim please do a setup with Tenda 3G150B asap. Asim can you please comment on whether this setup will let me access internet through EVO on a wifi enabled mobile phone? Plz let me now what is its wifi range …. in one house if it is in one room can we share its wifi signal in other rooms or say in the courtyard …. I want to use two pc and a laptop at different locations in the same house. Unsure but the most important thing I noticed is that it has a limit of 5 devices which Tenda’s original model did not had. So in a way, PTCL is crushing competition. does it transfer internet through lan port ? what about the battery backup? or get the standard EVDO package prepaid and just dont recharge it the next month and it will just go to dormant form automatically!! You can come back to PK the next time and recharge the account and get it in active form again! Dear Asim bhai pleas help and suggest me, i have PTCL EVO 9.3 G USB but i face the probelm is that i mostly using skype with my realitive but when i using in my Loan area signal is coming very fine every thing is working lush but when i am going to my rooms signals going to down and skype going very poor , therefore i request you to what should i do help me. Are you using EVO with some wireless router or direct USB connection? One last thing, have you checked how would be the farthest possible for (N) devices to connect? In want this device how can i get and how many pc’s i can connect with this device ?? .. and also tell me the prices please ..
Hi Asim….i appreciate the work you have done…i have Evo nitro am using it with TP Link MR3020 router…I have a question hoping that you could answer.Is it possible to connect it to internet using EVO without connecting the router to LAN card. I am concerned about the speed while using EVO with this TENDA Device. Did you notice any significant decrease in the downloading speed? I am using EVO directly plugged into my laptop, and I am getting a highest of 370kbps downloading speed at late night. But usually 100-200 kbps in day time or in peak hours. So I will be glad to know about the speed you are getting with and without the TENDA device. EVO is not portable cloud and vice versa. Any portable Wifi device will work 100% regardless of how good or bad the EVDO or GPRS (incase of GPRS USB devices) is so your concern is not valid. The only thing that you will see lacking in this setup is the “signal” monitor. I have bought EVO WiFi cloud couple of days back. Its giving very low speed. Is there anything i can do for it? have you tried it with any router? i didnt buy tenda but bought a tp link evo router, when i connect it it shows that yellow sign infront of the bars but when evo is connected directly, it works. Help plz! I have no experience with TP Link, sorry. Wish I could help!! First let me know the model number of tplink then I could help. I am considering PTCL’s EVO Wingle 9.3 which has wifi. I live in a fairly large area so I need extended wireless access, so is there any way I can use the EVO Wingle 9.3 with a bridged wifi router? I am using DD-WRT. Can I connect to this with my desktop PC(Without a wireless adapter) through the WAN/LAN port? and will my PC get internet?if so could you please tell me how. How can I find out how many users are connected to my Tenda device? I have EVO black USB. What is the Range of Tenda 3g150b? Sir, i m facing problem from last 3 days after purchasing Evo Wingle. I was using Evo 3.1mb on my Tplink MR3220 Router and it was working perfect. after release of Wingle i purchased it but it is not working with my same router. I think there is any different way to configure it. i want to share internet through this router because i m using domain over Win Server 2008. 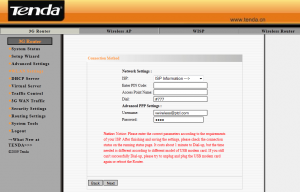 Please help me on urgent basis and tell me how to configure EVO Wingle on my Tplink MR3220 Router. can you please help me how to setup tenda model: 3G622R+ with evo niro 3G. I have a question regarding Tenda 3g150B. I have recently started using this device and when I connect it to powersupply, the battery light is blue and when I disconnect the power supply, battery light is red even after charging it for hours. How long does it take to get charged? As according to my knowledge, red light is giving an indication that battery is on threshold. How long does it takes to charge? BLUE indicates that the battery is charging or on AC. Red indicates that battery is discharging. It does not indicate that the battery is almost dead.